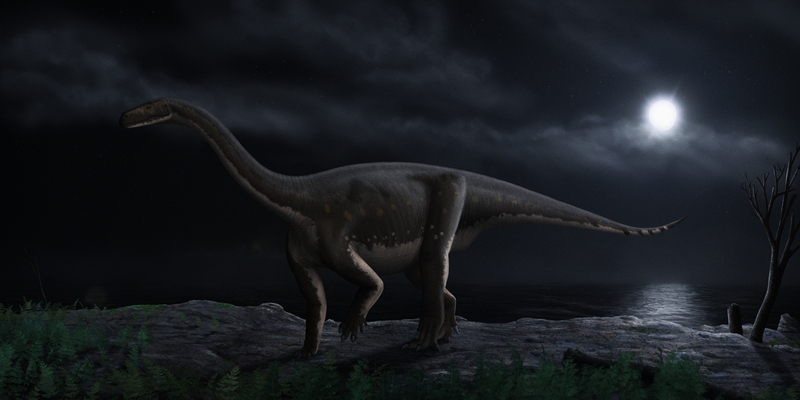 Reconstruction of Melanorosaurus readi, copyright Steveoc 86. The Anchisauria is a clade of prosauropods defined by Galton & Upchurch (2004) as the smallest clade including Anchisaurus and Melanorosaurus. Characters (from Galton & Upchurch 2004): Length of prefrontal subequal to that of frontal; frontal excluded from margin of supratemporal fossa; at least five teeth present on premaxilla; ratio of forelimb length to hindlimb length greater than 0.60; pubis with pubic foramen completely visible in cranial view; femoral shaft straight in cranial or caudal view; femoral fourth trochanter displaced to caudomedial margin of shaft; proximal end of metatarsal II hourglass-shaped.